Due to recent news (to me) about an old friend, it had been an emotional week. The hiking that I had been able to get out and do was less about taking pictures and sharing the experience with other people…and more about solitude and conversations with the things that haunt the woods and myself. 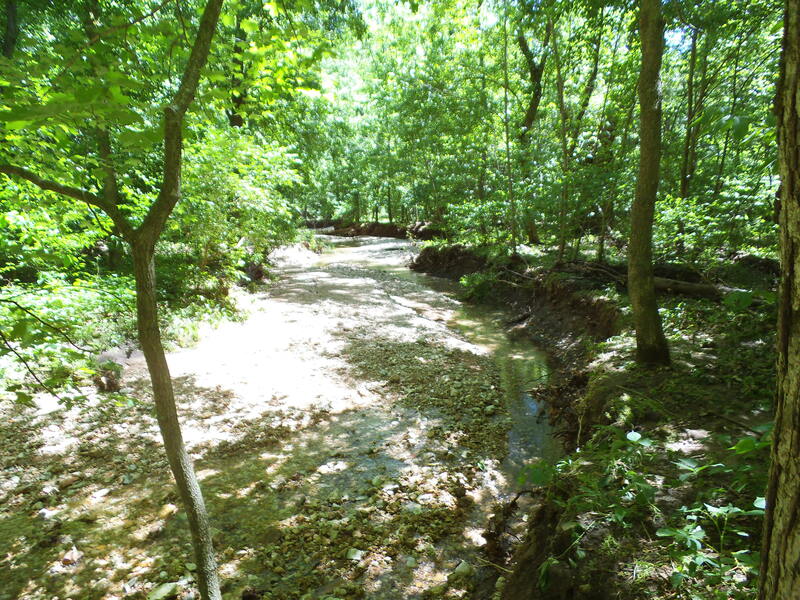 However on one of those days, motivated with inspiration by the work of the the people at North American Educational Explorers, I decided that I needed to head out to St. Charles County to the Weldon Spring Conservation Area and check out the Lewis and Clark Trails. 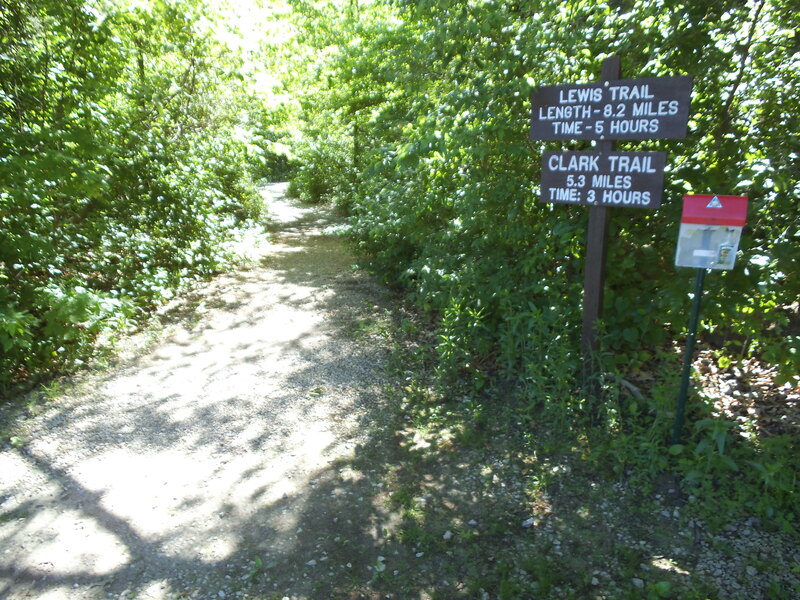 They are broken up into two loops with the Lewis Trail being 8.2 miles and the Clark Trail at 5.3 miles. Sure, I had brought enough water and a lunch for Max and I, but I didn’t feel like spending ALL day on the trail…at least not this time. So we kept it light and decided to hike the shorter Clark Trail. From 270 and 44, go North on 270 until you hit 64/40. Take 64/40 West, out through the Chesterfield Valley, across the Missouri River at the Boone Bridge, and around to 94. 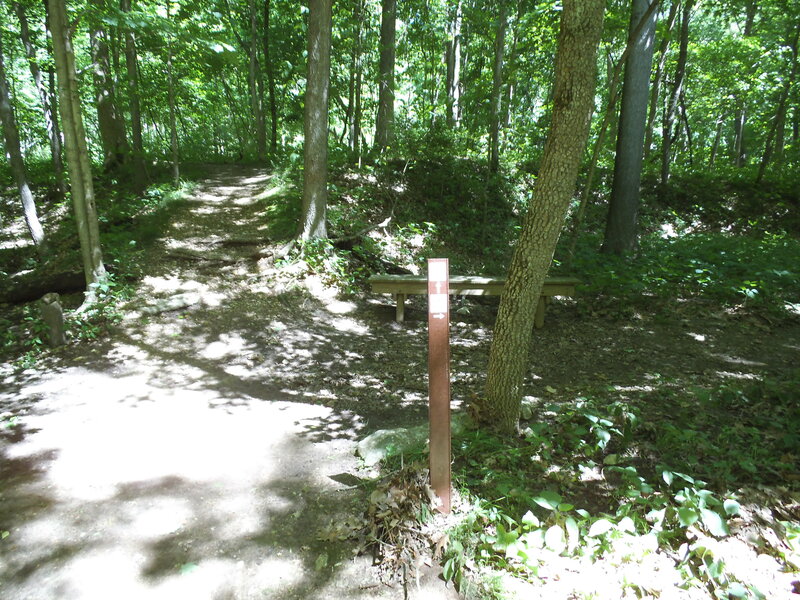 Go South (Left) on 94 and take that about…let’s say 5 or 6 miles, to the trailhead for both trails. It is a gravel parking lot on the left side of the road as you go into a right hand curve, and there is a conservation area sign at the roadside. In total, it’s probably about 28 miles from point to point…and not too bad of a drive if the traffic on the interstates is moving smoothly. The trail starts out pretty flat and open for the about the first mile or so, but as you leisurely stroll through the woods, appreciating the Maple trees and (gulp) Poison Ivy, you will soon realize that you are walking on an ever narrowing ridge that very soon starts to head downward to the river. Before you a chance to descend that far, at around a mile and a half, you come to an informational sign that tells you about some of the conditions that the Lewis and Clark expedition faced at this point in their journey west. There is a bench here, but you won’t need to rest…yet. The trail takes a sharp left and heads even further down, and into the gulch away from the direction of the river. Just about when you hit its lowest point on this section, it turns to the right and reverses direction again, and you spend the next mile or so heading along the bluffs over the river, ducking in and out of the deeper woods on occasion. At around two and a half miles however, the trail makes its final turn away from the river, and you descend into one of the more prominent creek bottoms in the area. This is a place to pay attention to the trail blazes, as at one point I started to follow the trail to the right and soon realized that Max and I were headed off in the the wrong direction and back out to the river again along the Lewis Trail. So I turned around and got back to where the two trails join up, and sat on the bench and had a snack. As you continue the hike, it follows the creek upstream for about half a mile before it climbs steadily up the hill on the right. After you get to the top, the trail is a continuous series of mostly slight inclines up and down, wandering through the woods around curves and over relatively dry watersheds and creek beds, getting closer and closer to the sound of traffic on 94, until you emerge from the woods nearer to the other end of the parking lot from where you set out. 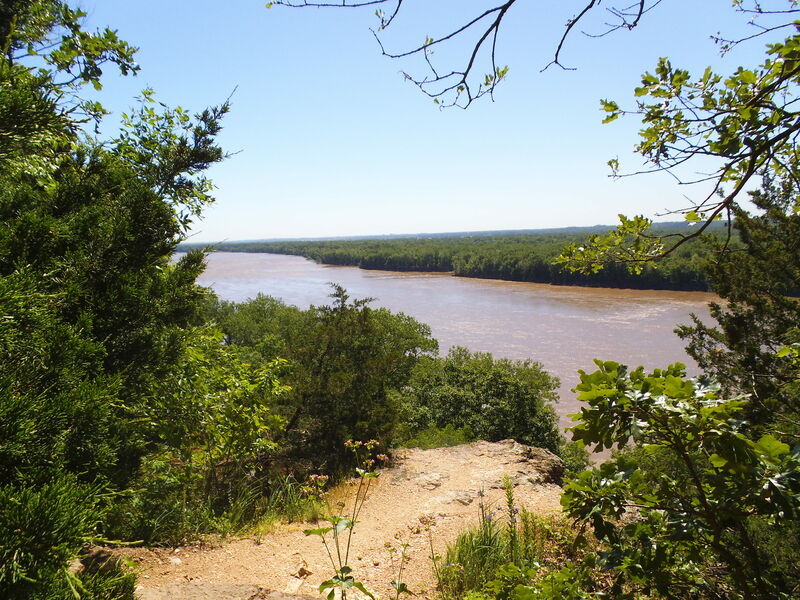 The Bluffs over the Missouri River. I’m sure there are impressive views over impressive rivers all over the place, but these may be some of the closest to where I live. Definitely worth seeing at least once. 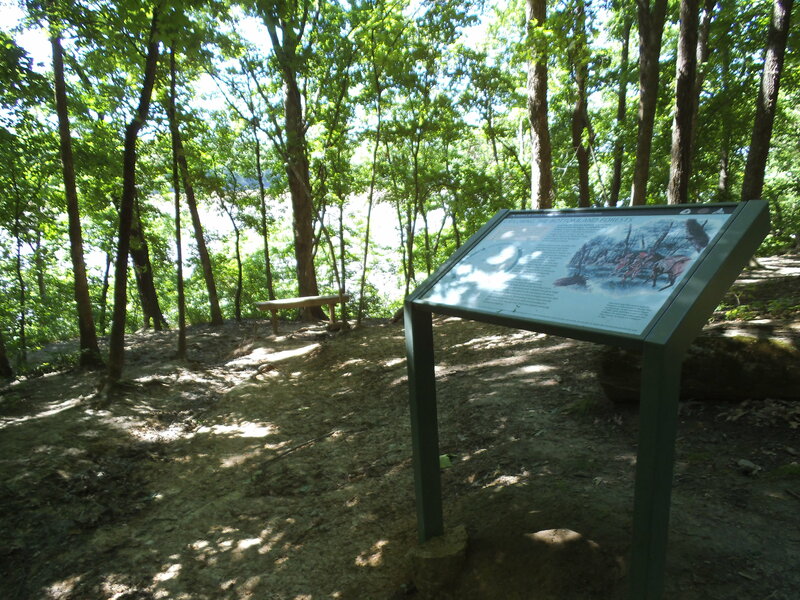 It holds a lot of history for the area and for America in general, as it celebrates the adventure that Captain Meriwether Lewis and Second Lieutenant William Clark, along with their band of selected men, embarked on from the St. Charles area right down the river from there, just over 200 years ago. I would call this trail Difficult. It isn’t just a stroll through the woods, what with its length and elevation changes. Bring a snack and something to drink on a day without plans, and really take your time to enjoy the area. I saw a lot of Poison Ivy out there. 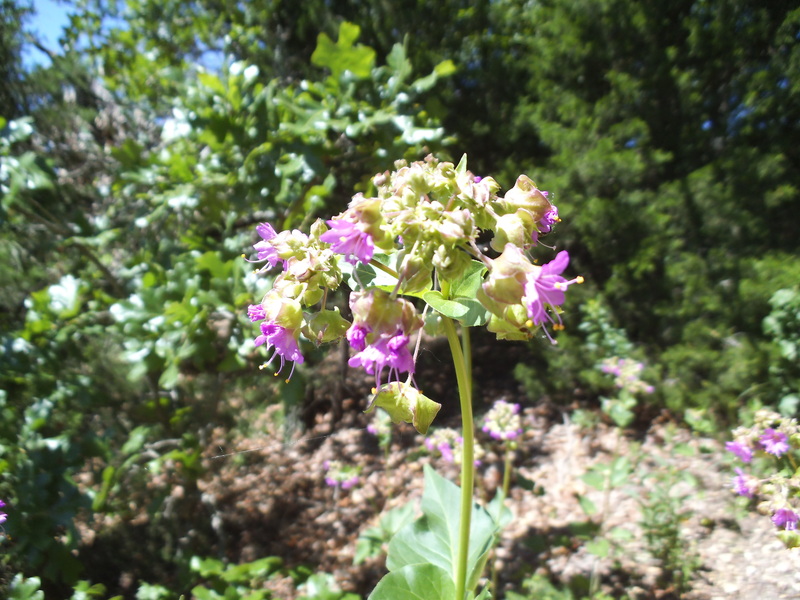 Now, I have been learning to identify Box Elder and Fragrant Sumac, both of which I also saw along the trail…but there was a lot of Poison Ivy. Between that and the bluffs, make sure you keep your dog (and your kids if they are squirrel chasers too) on a leash. Overall, this was a good, strenuous, and satisfying hike, and it helped to get my mind to a more positive and optimistic place. There were other people on the trail, and I got the impression that it was a regularly enjoyed conservation area by all sorts. 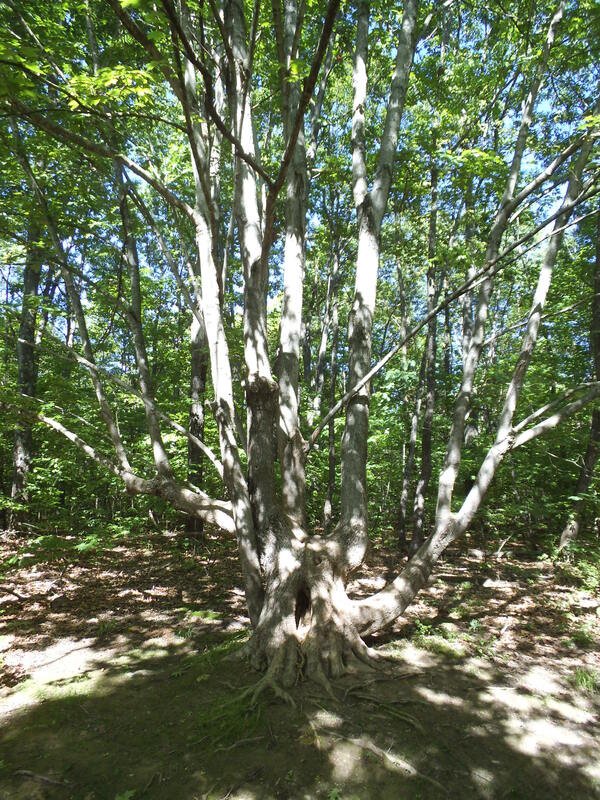 Plus, it was about time that I headed a little farther north to hike in the woods. I am looking forward to getting back there to do the longer Lewis Trail someday.